Finally, we made it to one of the best ZOOs in the Czech Republic and after visiting, it’s now our favorite. It’s a 1.5 hour drive from Prague, so a cool day trip. The Zoo is compact in size despite it’s additional safari grounds and we had the feeling that the animals looked happy despite their captivity. 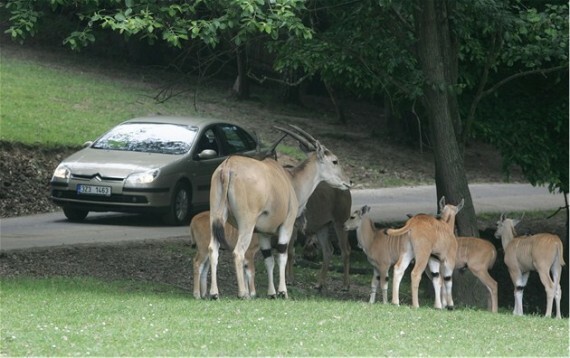 The Safari by Bus was thrilling and since 1 June you can experience the Safari Park in your own car!!! Which is a huge deal! Unfortunately we didn’t manage to try out this self-drive Safari ourselves and I am still wondering how will this be organised. I can imagine it will be a nice experience for sure - yet again be ready it is a small Safari. A few Zebras here, a few Antelopes there…. and several Bulls and that’s pretty much it. I am planning on going back so when I do – I will edit this article. Maybe YOU can let us know how went if you manage to go. Any comments are most welcomed. We will get back to the Safari at the end of my entry. Now – lets start at the beginning when entering the ZOO’s gate. What I love about arriving at Dvur Kralove is that there are signs with directions all around the town as well as on all highways within 20km of the Zoo. Everybody will find it. There is a big FREE parking sign right in front of the ZOO so do not get fooled by other parking 10-15 min away from it inviting you in. They are just trying to attract you so you spend some extra cash in their restaurants and Souvenir shops. No, no, drive all the way to it. When we entered it took us a good 15 min to drag our boys out of the big playground that is right at the entrance where the restaurant is. This is where you will end up when you exit so save you energy and leave it for later. I suggest going to the right where the ZOO starts. To the left you will find a Kids World with a Petting Farm, train ride and other kids attractions. If we went here from the beginning I doubt we would even make it to the Safari. It’s so thrilling to find all the wild animals you came to see all together. It was refreshing to see the Tiger offspring having a fight - it so much reminded me how all little ones are the same. The Tigers could be all perfectly visible and I am telling you - I had respect. When I compare this to Prague’s ZOO, I so much prefer this one. It honestly seems to me that all the animals can be seen much better and you don’t have to walk around that much. For example - I have been to Prague’s ZOO five times and seen just one tiger. Here you feel the connection wit the animals. Through out the whole ZOO you will have the chance to walk into open space pavilions and be in NO FENCE proximity to the animals. Believe it or not - I was standing just 1m away from a Pelican and I was a bit scared if it would clamp me or not. It was a nice exitement. What was absolutely thriling was the Rain Forest Pavilion. Inside - freely on a tree there were little orange Monkeys we immediately fell in love with. What a big change it makes when you can see the animals just a few metres above you without any wires and fences. They were so cute and funny and quite fussy about taking pictures. In general the great display of Big Fish and a Huge Croc was amazing. Right at the entry to the pavilion I stood still and for the first time in my life I saw a real ANACONDA snake. My God. It was huge and I can easily imagine a human being eaten by it. I honestly could not believe I could carry it. The Elephants have an amazing pavilion to themselves and we caught one taking a bath. It honestly looked happy. Eventually we discovered that there is a Cafe facing the elephant grounds so you can pretty much sit, have a coffee and observe them in comfort. Someone thought well. In general there are so many different kiosks all around the ZOO that you can never get hungry or thirsty. Again - comparing to Prague - more choice is on offer. When we thought we made it to the end of the animal display we discovered a yellow train. Well, discovered it…. it was hard not to - the driver was attracting the crowd to hop on it in order to be taken to the Safari Bus that was 2 km away. Ha, trust me - we didn’t need any more persuading and happily payed 125czk for the whole family so we don’t have to walk the 2 km. That you can do in advance when entering the Zoo or you can pay the Cashier next to the second gate. Or you can just pay the driver - either way you need a ticket to show him. I know - lazy bums, but we didn’t have much time any more and rushed to the Safari. On the way there we drove through the back part of the ZOO that we had no clue about - this had an amazing display of Rhinos, Giraffes and Hippos. The ticket is just one way so if you want to have it easy and not walk back, you will have to buy a Return ticket. There is a ticket office is at each end of the train route. When I thought we had been waiting for too long a time I started making a fuss, asking for the driver and when are we leaving, that my kids are hungry, that the other people can get on the other bus - blah blah blah - so suddenly the driver appeared and we went. He told us he was waiting for some more people to come, though - I think he was just lazily chatting away with the other drivers because there were 2 more buses behind the one we were sitting in. What you should know about this ZOO is that it covers an area of 6.5 hectares and was formally opened to the public on 9 May 1946. Josef Fabián was the zoo’s first manager and the museum curator at this time, holding these posts from 1946 to 1953. Surprisingly, all the cages and enclosures had to be constructed by zoo personnel, particularly during the first few decades in the zoo’s history. Most significantly, an old greenhouse for palm trees was transformed into the Tropical House, housing primates, birds, and Rémus, the first lion at Dvůr Králové. The ’70s were an important time for the zoo, as 8 expeditions were organised to a number of African countries, resulting in around 2000 animals being brought into the collection. This focus on African animals was the brainchild of Josef Vágner (Dipl. Ing. ,CSc. ), the zoo’s director between 1965 and 1983. These were largely hoofed animals along with some carnivores, primates, and reptiles. The creatures formed the basis for unique breeding pairs and groups that made the zoo one of Europe’s most important gene banks for numerous African ungulate mammals. By Car: From Prague You need to hit the E67 Highway towards Hradec Kralove. When you pass Hradec Kralove keep driving towards Jaromer. In Jaromer you will just simply follow the signs to Dvur Kralove Zoo. They are very visible. By train: The Dvůr Králové nad Labem railway station is on the 030 route from Jaroměř to Liberec. The station is a regular stop for all express and ordinary trains. Some buses run from the station to the Zoo, but not all go right the way to it. Alternatively, it is a 3.5 km walk. By bus: The bus station can be found in the eastern part of the town. A 2 km walk will still be necessary through the city. From 31 May up to 28 September, there is also the option of hopping on a city bus.